I love walking. That is, I love taking walks. Sometimes long with no destination, sometimes just short errands like a few groceries for dinner. Portland neighborhoods are delightful for walking—an endless front yard display of interestingness. Some folks have the full front-yard vegetable or flower gardens, some are full of scattered toys and rope swings, some with rusted metal sculpture, some with lounging cats, and many with some form of signage. The most frequently seen signs in front yards, near the front door is a security system sign of some kind. It seems that guarding against burglary is high on the list, although I never knew Portland to have an especially high rate of crime, it does happen. People want to feel safe, it seems. There are lots of cats, either watching passersby from a window, the front porch, or the bold cats who step out and demand petting. Then there are the political signs, of course, and there are the values signs that say what’s important to the resident. 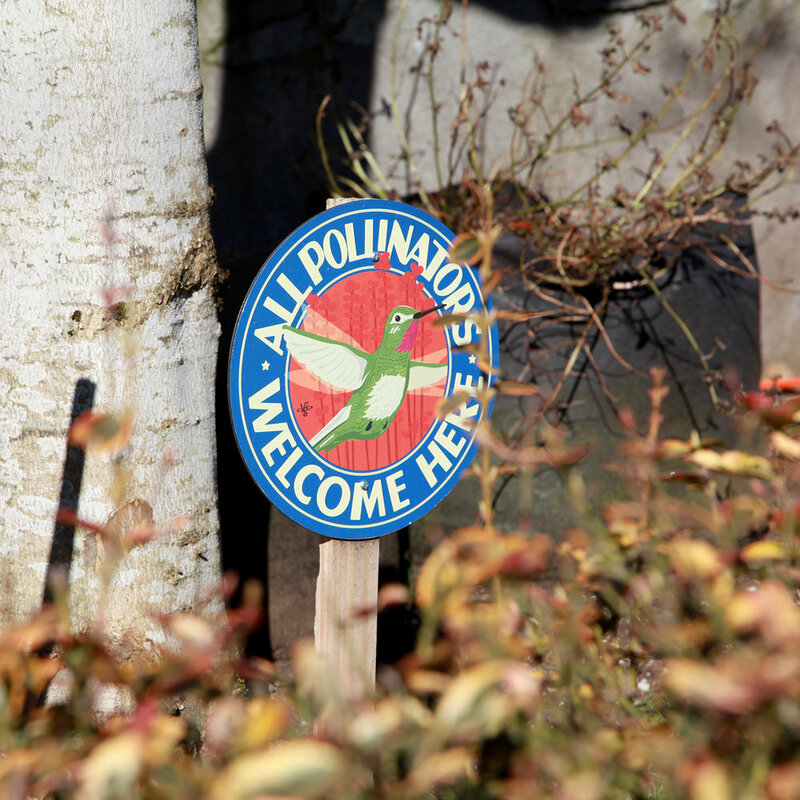 My favorites are the homemade signs, like one gem I get to pass regularly that simply says, “You are not powerless.” The local Audubon society does a backyard bird habitat certification whereby residents to qualify get a neat sign explaining what a bird habitat entails. In America, we have so much signage around us, especially advertising messages. But these yard signs I see are not commercial interests—they’re from the heart and show me what really matters to the residents. Sometimes lighthearted, sometimes interesting, always underlining that fact that you’re not alone, that we can engage in a type of sharing between ourselves and the neighborhood at large. I can guess that for most people, besides what you do on Twitter, these yard signs are the only way we declare our values to the public. My own garden sign designs are directly inspired by my treks through Portland neighborhoods. I too wanted to contribute to our neighborhoods’ atmosphere, the sense of peace and friendliness that we want to cultivate, and most of all, to declare what we feel is important. This sign, while welcoming pollinators that are presumably hummingbirds, could apply to more than just birds and bees. Our friends and neighbors can be cross-pollinators of ideas and viewpoints, making our community stronger. I want to make signage for those who want an atmosphere of positive messages.